Steve Nash is headed to the Los Angeles Lakers after the Phoenix Suns agreed to a sign-and-trade deal that will bring them four draft picks. The Lakers will give Nash a three-year, $27 million contract. They used the trade exception they received from last year's Lamar Odom deal with the Dallas Mavericks. "He's ecstatic," said Billy Duffy, Nash's agent. "He gets to be close to his children." The Suns will get the Lakers' 2013 and '15 first-round draft picks and their 2014 and '15 second-round selections. The Lakers also paid the Suns $3 million to facilitate the trade. Phoenix radio station KTAR 620 first broke the news of the Suns' sign-and-trade agreement with the Lakers. Kobe Bryant and Steve Nash talked about playing together with Lakers on Monday night, and again late Wednesday afternoon, a league source told Y! Sports' Adrian Wojnarowski. The New York Knicks, Toronto Raptors and Dallas Mavericks had all tried to sign Nash, but he turned down more money – three years and nearly $36 million from the Raptors – for an opportunity to chase a title with Bryant and the Lakers, and to be closer to his children. Nash is divorced with two daughters and a son. "His intention, as related to the Suns, was if he left that they would get value, that he would have the ability as his career was winding down to come to a competitive situation," Duffy said. "But his most important aspect was his ability to be close to his children. He's an hour from his children. I've never seen him happier because of that fact alone." Duffy said Nash briefly considered retiring at the end of last season. "Everything in his mind was predicated on his children," Duffy said. "It put me in an interesting situation because I knew that dynamic. It wasn't about the most money. He turned down a lot of money and aspects of other deals for the well being of his family." The Lakers were one of 10 teams to contact Nash on the first day of free agency, but the Knicks and Raptors appeared to be his most likely destinations. The Knicks also tried to work a sign-and-trade deal with the Suns. "He was either going to go to New York or Toronto," Duffy said. "He was comfortable with either situation." The Lakers stepped up their interest on Monday. "The dynamic with his family made [the Lakers] more compelling," Duffy said. "It began, really, two days because of the Lakers' willingness to step up and [Suns owner] Robert Sarver's willingness to work with us collectively to bring him back value. [Nash] could have gone to Toronto outright and the Suns got nothing. Steve likes this because he knows the Suns are getting assets back." 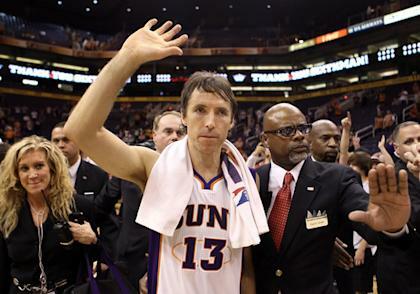 Despite Nash's close ties to the Suns, Duffy said it was time for him to move on. "They're in a rebuilding mode," Duffy said. "They need to grow away from him at this point."